Medium - $39.99 Only 1 left! Did someone say TEA time?! Yay! Actual tea time! As it is tea-time o'clock, you may have noticed Ms. Madeline Hatter has already provided some tea from her hat-of-many-things... yes, she is sitting in the middle of the floor. No, she won't move to the table. She's getting a little worked up now? Yeah, we found it's best just to sit down and have tea with her where she's at (you know those Hatters). It's really all for the best. And trust us, her tea is the best. Honestly, there's lots of reasons to love Maddie. Wonderlandian magic, her riddle speak, her energetic personality, and of course her heavy dose of healthy madness always lightens the mood. Did you know she can even hear the narrators? (We're not sure we believe her either.) She always brings the party to wherever she's at... the tea party that is! 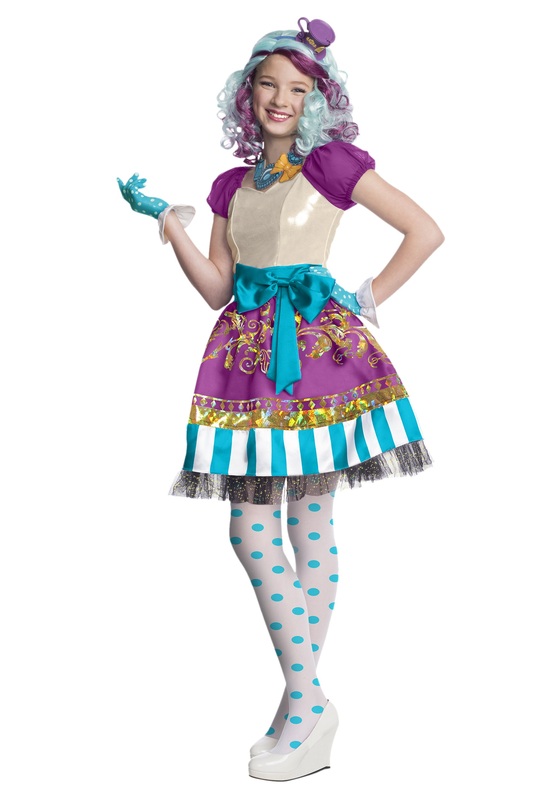 So if you're feeling particularly colorful, check out Ever After High Madeline Hatter Costume. The costume is in her classic colors of turquoise and purple, with some white and gold all over. The dress, gloves, and tights are included with all the polka dots and stripes one could want! Bright colors, swirly prints... you'll be the belle of the tea party. Trust us. We're all mad here. NOTE: wig w/ headpiece sold separately.